As a scholar concerned with the life and work of C.L.R. James, I have worked in collaboration with Professor Robert A. Hill, the literary executor of the C.L.R. James Estate, to prepare a special edition of James’s previously long-presumed-lost 1934 play on the Haitian Revolution, Toussaint Louverture: The story of the only successful slave revolt in history for its first ever publication. James’s Toussaint Louverture stands as the literary companion volume to his masterful classic 1938 history of the Haitian Revolution, The Black Jacobins. The play was published for the first time in Spring 2013 with Duke University Press, launching an important new ‘C.L.R. James Archives’ series. 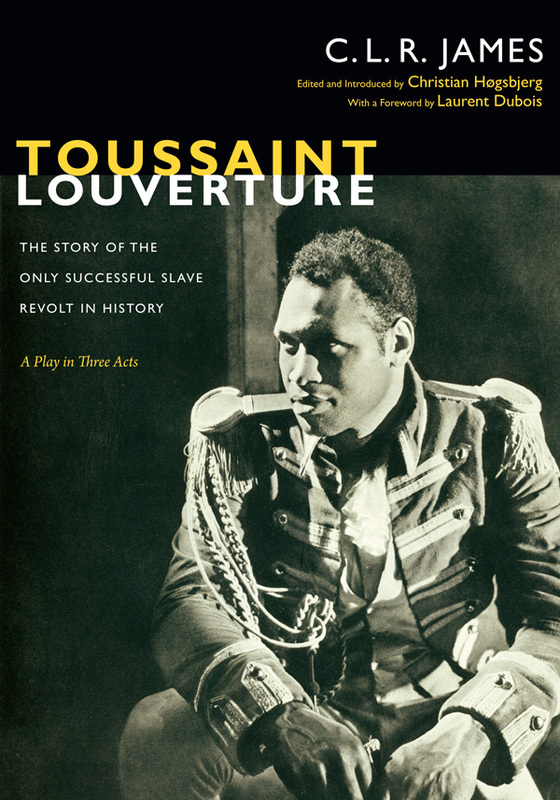 James’s Toussaint Louverture, which was staged in 1936 at London’s Westminster Theatre with Paul Robeson in the title role, was the first time black professional actors had starred on the British stage in a play written by a black playwright, and the only time Robeson starred in a play by a writer of African descent. The play stands as one of the most remarkable plays written about the Haitian Revolution, and the 1936 production was a pioneering moment in the rich but often hidden history of African theatre, Caribbean theatre and black theatre in Britain. This special edition includes the programme, photographs, and reviews from the 1936 production, a contextual introduction and editorial notes on the play, and selected essays and letters by James and others, and launches the new C.L.R. James Archives series with Duke University Press. Bridget Brereton, Trinidad Express, 30 July 2014. Leslie James, author of George Padmore and Decolonization from Below, Journal of Colonialism and Colonial History, 16, 2 (Summer 2015). Publication of Toussaint Louverture is such a resource for all readers. There could be no better work with which to launch the important new C.L.R. James Archives Series, edited by Robert A. Hill for Duke University Press. introduction to the play edition reveals the “rich texture” of the original play, thoroughly grounding it in its many contexts. I view James’s play as an expertly executed meditation on the intersections of statecraft (abolitionist black nation building) and stagecraft (the dialectics of arranging individuals and masses onstage). The volume’s array of materials includes a facsimile of the original playbill, a substantial collection of theatre notices and reviews of the original London production, germane James and Robeson essays, and correspondence (including a fascinating query from pan-Africanist George Padmore to Alain Locke requesting help to produce and publicize James’s play), as well as magisterial prefatory essays by Høgsbjerg and Laurent Dubois, eminent historian of the Haitian Revolution. Jeremy Matthew Glick, author of The Black Radical Tragic: Performance, Aesthetics, and the Unfinished Haitian Revolution, Theatre Research International, 41, 3 (2017).